The gravity racer was designed and constructed by the team at CSER (Heather Driscoll, Terry Senior, Alice Bullas, John Hart and Christina King). As with most engineering projects, we did not have an unlimited budget or time, so where possible we tried to use and modify bought in components. Modify is the key word though; apart from the safety harness, there is not one component on the racer that has not been altered. 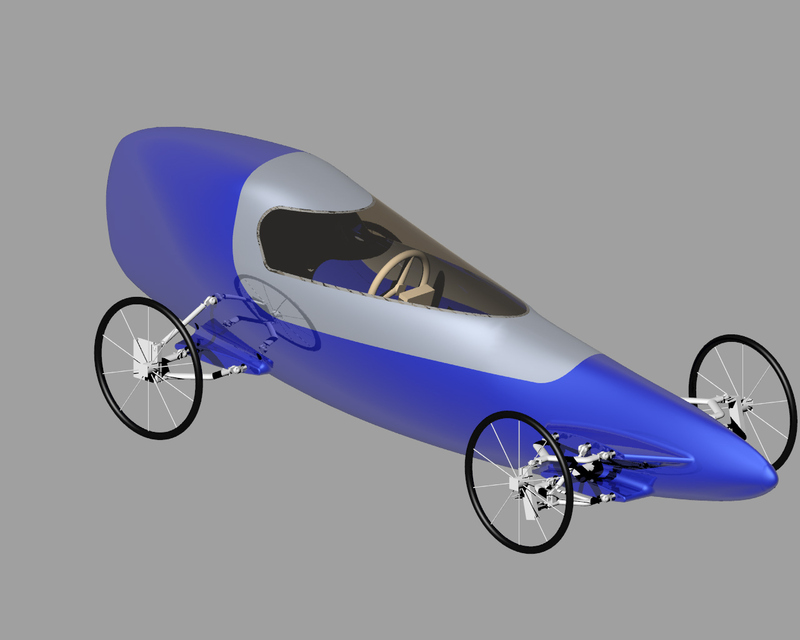 Our original design intent was to build the racer around a composite monocoque body with no internal frame system. This would have allowed for a much smaller frontal area and low centre of gravity. A well designed monocoque should be as strong, if not stronger than a tubular chassis. As we were unable to make this in-house we were reliant on our external suppliers, who unfortunately were not able to provide us with something that we were confident would take the structural loads in the event of a crash. As such, we changed our original plans and modified the design to accommodate a steel, tubular chassis. The racer was designed specifically for Guy Martin. We chose to seat Guy in a near recumbent position. This was selected to keep the frontal area low, but allow him to drive naturally and have a clear line of sight. There were discussions on using methods similar to periscopes or front facing cameras to allow Guy to be fully recumbent but these can often give a delayed response and a sense of detachment from the driver and track. Obviously, Guy was an integral part of the system and his superior driving skills needed to be made best use of in order for us to stand a chance of breaking the record. 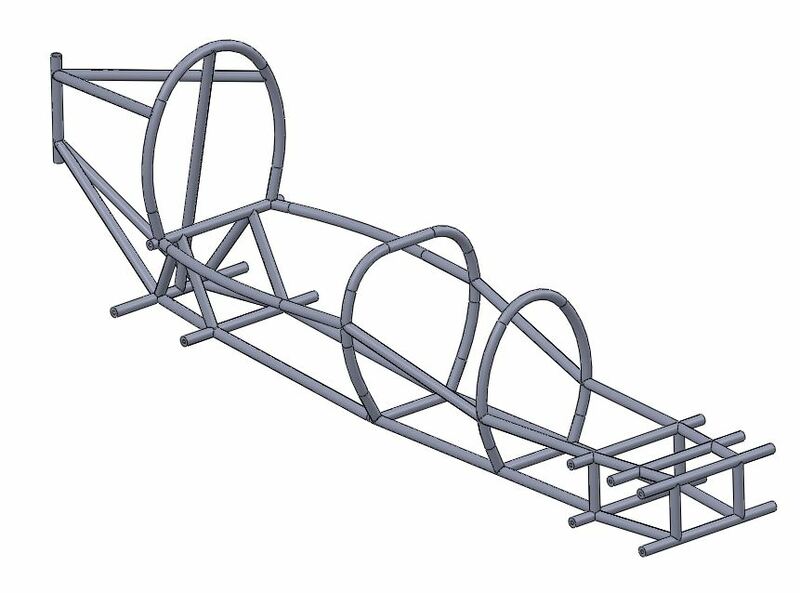 Using a CAD model of Guy and approximate sizes for the braking and steering components, we were able to design a tubular frame that was close fitting but yet still incorporate standard roll cage features. The track of the racer was approximately 1.025 m and the wheelbase was 1.650 m. When we started the design of the racer the final run venue was not confirmed, this meant we could not optimise the wheelbase to track ratio based on the run profile. If designing for a long straight road, we would have increased the wheelbase, and if designing for lots of winding switchbacks, a wider track might have been better. Although not deliberate (or scientifically based) our wheelbase to track ratio was close to the golden ratio of 1.618. The frame was fabricated by Parish Engineering from steel tubing. We then calculated the centre of mass of the frame and welded in fixed plates of steel to alter its position to be more central along the wheelbase. We deliberately went under the target 200 kg so we could tune the centre of mass position during the record attempts. The shell of the racer was made from fibre glass by EPM and was not designed to be load bearing. Its purpose instead was to minimise the aerodynamic drag force by reducing flow separation and stagnation. Dr John Hart optimises equipment aerodynamically on a daily basis so was able to use his experience as a starting point on a suitable shape. This was then further analysed and evolved using the CFD results from ANSYS simulations. 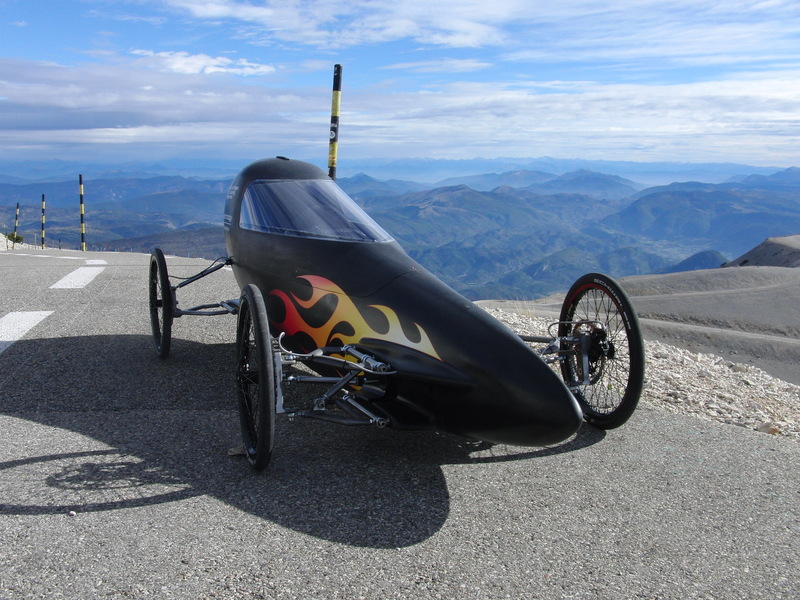 The resulting racer had a drag coefficient of 0.3 which although was not as low as it could have been without an internal frame, it was a respectable value for a vehicle of its size. The shell was mounted to the frame using polyurethane adhesive; this ensured it remained flexible and responsive to the compliance of the steel frame. The biggest decision here was whether to have suspension or not! 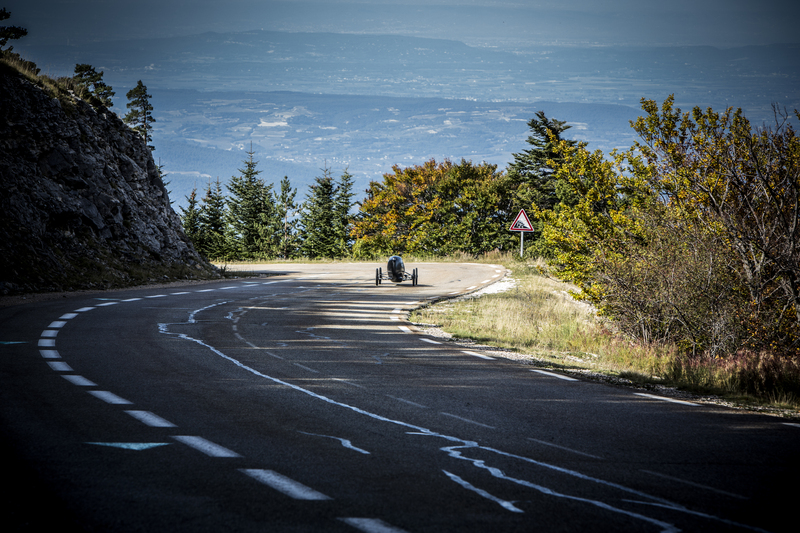 Suspension can help keep the car grounded on undulating surfaces and provide stability during sharp turns. But if incorrectly tuned can lead to energy loss and reduced speeds. We decided to buy the wishbones from Formula Gravity as they gave us the flexibility to include suspension shocks if the surface required them. The intention of purchasing instead of making them ourselves was to save time, but in the end we had to re-machine them anyway to give us the precise geometry we required. We had a double wishbone at the front although they were not parallel; the top wishbone was offset slightly to give better turn-in during steering. We decided not to include suspension shocks on the final attempt and instead used the compliance from the tyres and tubular frame to ensure all four wheels remained in contact with the ground. Guy’s feedback was that the racer’s handling was responsive and predictable and so we are happy with our decision not to include suspension. We do not believe lack of suspension was the cause of the final crash. We used 20″ wheels that were specifically made to be side mounted. They were chosen for their low rolling resistance, good laterally stability and availability for vehicles such as this. The tyres used were Schwalbe Kojak and we varied the pressure from 75 to 85 psi based on Guy’s feedback. A small rack and pinion steering system was modified to fit between the wishbones at the front of the racer. The design used gave very quick steering input and precise feedback. Although Guy is more at home racing bikes, we chose a small racing steering wheel rather than handlebars as space and control wise it was more appropriate. The final run had several bends that required Guy to carry as much speed through as possible; the steering system chosen allowed him to do this. The brakes used were Tech 3 V4 hydraulic disc supplied by Hope Technology. The caliper used four phenolic pistons and we coupled this with the vented disc brake on all four wheels to maximise our braking power. The vented rotor used internal fins between the two friction discs to dissipate the heat build-up. Guy limited his use on the brakes down the run but they were vital to bring the racer to a controlled stop before the final hairpin bend. You could really feel the heat radiating from the brakes at the end of the run, so although some people think they are over spec’d for your standard mountain bike, they were perfect for our use! We modified the standard lever system to run off a single foot pedal. An adjustable bias valve was used to split the braking power between the front and wheel rear sets. When coming to a stop the majority of the braking power was needed on the front wheel, so we were able to shift the bias to prevent the back wheels from locking and going into a skid. As well as the roll cage protection, the racer was fitted with a five-point safety harness (SFI approved) and an energy absorbing (collapsible) steering column. 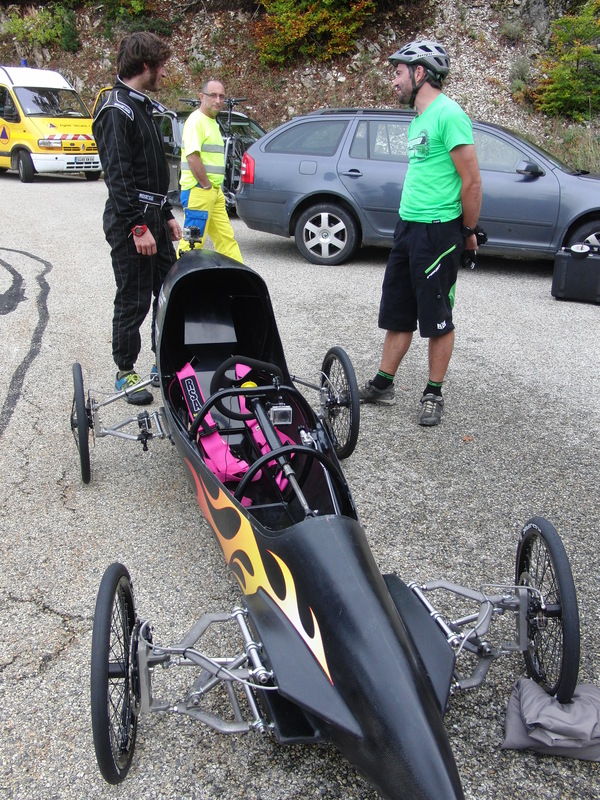 The harness was Crash barriers lined the length of the course and an ambulance also followed Guy down every run. The racer was initially set-up for stability with the centre of mass near the midpoint of the wheelbase. After an initial ‘slow’ run, Guy reported back that the racer felt too light and skittish on the rear so we added extra weight behind his seat to shift the centre of mass rearwards. Along with the centre of mass, we also adjusted the camber and toe-in incrementally throughout the test runs. The initial runs were set with negative camber and slight positive toe-in. Positive toe-in improves the straight line stability and but too much can affect the cornering ability. It was therefore important that we were able to modify this based on driver feedback. The racer was also initially set with negative camber to allow increased grip during cornering however this could limit the straight line speed as it reduced the contact patch between the tyres and surface. Although edited for the programme, we actually did around 15 runs making minor adjustments every two runs to optimise the racer. Each change was based on our theory and understanding of what we expected to happen and Guy’s driving experience and feedback from previous runs. Throughout the two days testing we were able to progress the speed of the racer from 71 mph to 85.6 mph. Some changes hardly affected the speed (camber and toe-in) but were vital to increase Guy’s confidence in the handling of the racer. Whereas others (weight and tyre choice) made a big difference; for example, swapping from the wider test tyres to the narrow, higher pressure Schwalbe race tyres increased the speed by 5 mph. As predicted by the Newtonian model, the weight of the racer was the real game changer. However, we had to be really careful about where the additional weight was added so not to affect the handling. The record run was weighted to approximately 200 kg and the crash run was a little over this. We believe it was the higher than expected forward transfer of weight on the crash run that caused the rear of the racer to become lighter and lose traction. This subsequently caused the rear brakes to lock. With the rear brakes locked, it was then impossible for Guy to keep the racer under control and as the racer spun into the crash barrier he sensibly tucked below the roll cage and resisted the temptation to put his hands down. In hindsight, we should have stuck to our initial plans of making incremental changes; this may have allowed us to adjust the brake bias enough to prevent the rear brakes locking. There is no way of knowing this for sure though, and when setting out to break a world record we knew that we were really going to have to push the racer to the limits. The vehicle was just one part of the system though, whatever design you come up with it still needs a driver, and it’s the driver that can make or break the record (…and the racer). Next blog article coming soon: location, location, location! Thanks for the full background to your very impressive project. Your report fills in much of the detail that the program obviously had to gloss over and makes very interesting reading. Well done everyone involved, it made gripping telly. Thanks for another gripping article (sorry, intended I’m afraid). It’s good to read much of the info that couldn’t really be included in a std length episode and for a mainstream audience. Your description/explanation of the crash sounds pretty fair. In my previous comments, I had assumed the body shell was a stiffening element to maximise torsional rigidity. Using a flexible chassis to conform to an undulating surface may seem archaic now but it’s a perfectly valid solution and a relatively simple and low cost one.. so my bad! Please keep the articles coming..! A question or two for the team..
1) Do you have the Cd/CdA figure for the shell in isolation? 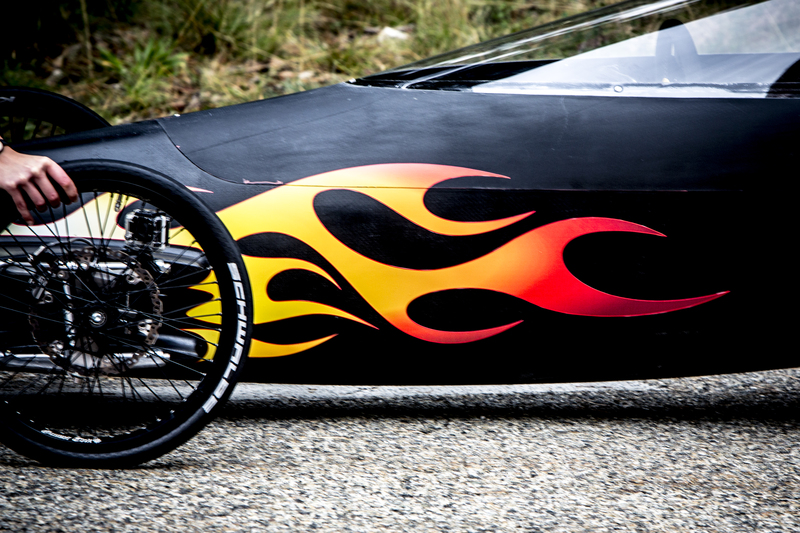 2) When calculating the run required to achieve the desired speed, were the input figures [Cd 0.3, 0.47sq.m or CdA=0.141] calculated/measured using the 48 spoke wheels (shown in the film), and if so, with the Kojaks or the fatter treaded tyre? 3) Assuming (again!) that the method of tyre selection was somewhat more extensive and precisely controlled than the demonstration in the film, how was rolling resistance actually calculated/measured and did you test any other tyres? 4) Do you have Cd/CdA & rolling resistance figures for the different tyres tested? 5) Do you know where the car ended up or whether its owners have plans to run it somewhere on the UK? Given that the car was designed inline with many of the UK competition rulebooks, it may be interesting to see how well it goes on some of the faster British courses against the best of the rest. Thanks for your contribution to the best bit of telly all year. I look forward to reading your response sometime. – The Cd value was for the complete racer (inc. suspension and wheels) but for enclosed hubs not spokes. We always planned to cover the wheels but unfortunately didn’t get round to it on the record attempt. – We based our tyre selection on recommendations and reviews. Ideally we wanted to perform a more controlled coast down test or perhaps use the pendulum method to give a better informed selection but again time was too short to do this. – Sorry, we have no plans to rebuild the racer at the moment but are looking forward to seeing other designs to challenge our record. Thanks for your answers. I appreciate the community spirit your team has shown throughout this whole project. One last thing: Do you happen to know the CdA for the vehicle in its final (record breaking) spec? I must have watched a different program . . . in the one I watched, the crew ended up just stuffing 2lt bottles of water in wherever they could, and all unsecured. No wonder it crashed, loose ballast is one of the worst things for stability in any vehicle. Just to clarify, the water bottles were located in either the foot-well or in the rear of the racer behind Guy’ seat. Once placed, the water bottles were not able to work free (i.e. they were rotated 90 deg after slotting lengthways through the small gaps). The front : rear placement of the bottles was controlled so not to alter the horizontal position of the centre of gravity of the racer. This was checked using weighing scales under each wheel. Steel plates were added to the frame during construction but we were hesitant to add too much ‘fixed’ weight at this stage as it was dependent on Guy’s feedback of the handling. Unfortunately we didn’t have any steel plate or welding equipment to hand during the record attempt so had to make the best of what we had. I agree, it was not an ideal solution but when balanced with an appropriate brake bias it worked well.